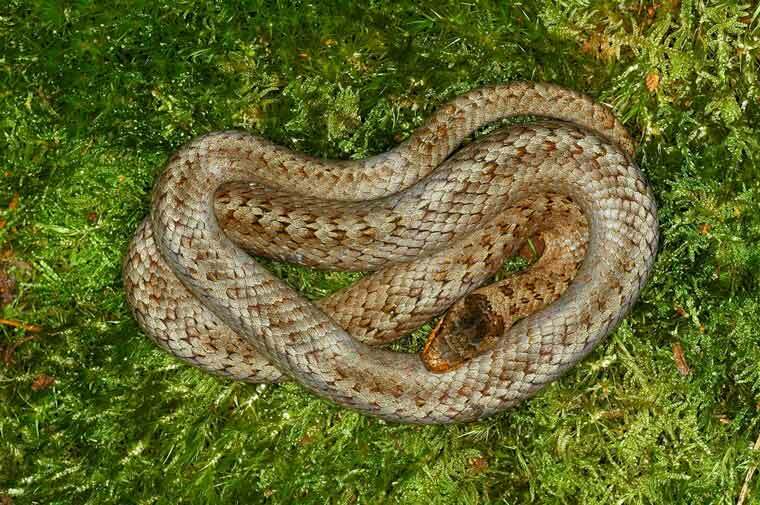 A rare, native species of snake has been spotted at Black Heath in Thorncombe wood, near Dorchester during a regular reptile survey being carried out by Dorset County Council’s countryside rangers. The smooth snake was spotted by Dorset County Council’s countryside ranger, Kath Clay, during a reptile survey being carried out at Black Heath. It is the rarest of the three, native species of snake and is protected, along with its preferred habitat, by law. It lives on well-managed heathland, where it is mainly found in mature vegetation that provides good cover. On these sites it can use a range of habitats, from dry slopes to humid and wet heath areas. Kath Clay said, “The smooth snake hides under stones, logs and other debris exposed to the sun, rarely basking in the open.” She explained that smooth snakes are difficult to find, but that the restoration work and continued management of the lowland heath is working, providing the perfect habitat. Thorncombe wood is managed by Dorset County Council’s Countryside service and is close to Thomas Hardy’s Cottage, the National Trust-run birthplace of the famous author.